Prepare for Unexpected Expenses with $50 Target GC Giveaway! | More Crunchy Beach Mama! Prepare for Unexpected Expenses with $50 Target GC Giveaway! We know they are going to happen, but yet… an unexpected expense still catches us by surprise time and again. The car breaking down, an appliance breaking, natural disasters like floods or hurricanes, or an unplanned doctor visit. How about personal disasters like a child breaking an arm at sports, or missing a week of work because you had the flu? All of these life events can stress us out and put pressure on our finances. Have you ever found yourself in this kind of situation? I think we’re all raising our hands on this one! Stress about finances puts strain on your body and overall health, which in turn, can create additional financial woes when you have to treat and manage stress-related illnesses! You see how it’s a vicious circle of surprise and stress, surprise and stress? But it’s one that can be broken, so you don’t have to feel behind the game all the time. Although we can’t know when and why these expenses will pop up, we can still find ways to get a handle on them by taking a few preparation steps. So while unexpected expenses can’t be completely avoided, you can minimize your stress and their impact by being prepared. 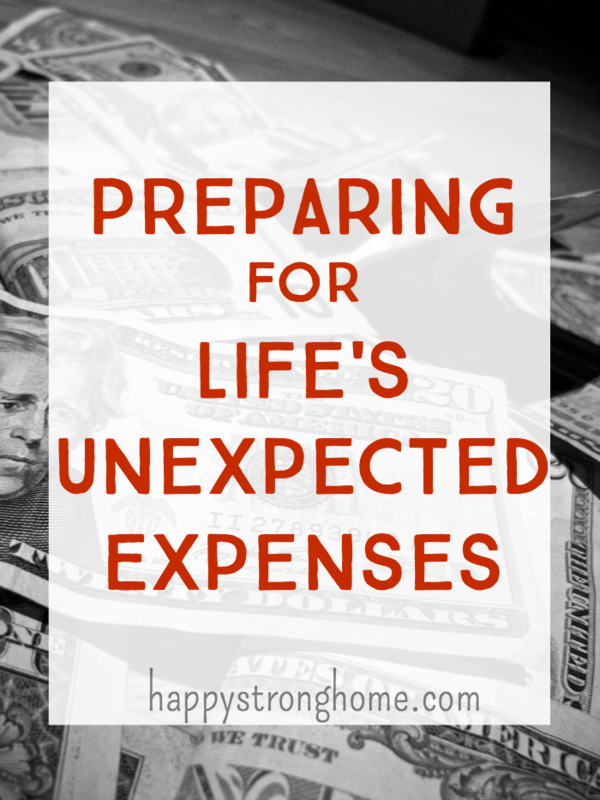 Julie from Happy Strong Home has some tips for preparing for life’s unexpected expenses! And how knowing your insurance plans can actually save you money!! And… she also has a giveaway for a $50 Target Gift Card – stockpiling a few extra gift cards to cover expenses is another great way to stay ahead of the unexpected! Check out her tips, and you can even enter her giveaway right here! This giveaway is run by Happy Strong Home. This site drives me batty. It took twenty tries to get it to take my answers and then my info. Bad programming on this site.